Working fulltime at the Old Vienna Coffee House at the Queen Victoria Building in the city, my allotted tables were all outside on the balcony, furthest away from the restaurant entrance and overlooking the floors below. If you could imagine working on your feet 8 hrs a day 5 days a week, with lots of periods of inactivity, you can appreciate it was an inordinately boring job. Every hour, on the hour, the big hanging clock inside the building would come to life accompanied by the same music. It would draw all the tourists in without fail, but its proximity to my tables was enough to cause me temporary hearing loss after awhile and drive me crazy. One reprieve about the Queen Victoria Building was that it was a tourist haunt, which meant I got to meet lots of interesting people of different cultures. It was later described by Pierre Cardin as the most beautiful shopping mall in the world; its aesthetics made it a little less painful to be there. Next door to the Old Vienna was this designer shop specialising in expensive leather clothing. It was manned by two attractive, leggy girls – one a blond and the other a brunette – with fake tans and spray-on leather clothing. They looked like the kind of models you’d see holding umbrellas at Motocross events or similar, frankly. And heck, did they get a lot of attention from the males who worked in the mall. The world around them practically came to a standstill every time they strutted out of the shop. They never seemed that busy either, and seemed to lean over their counter gossiping most of the day away, simultaneously flashing their legs and cleavages, whilst Aussie males found various excuses to go in to chat with them. The layout of the coffee house was such that my tables, being away from the main dining area and with their vista, were a magnet for backpacking tourists who just wanted to sit for hours over a cup of coffee whilst catching up on their correspondence etc. Most of these young backpackers were European, and I was their waitress. Thanks to the overall boredom of the job, I engaged in conversation with many of them, and made friends that way. There was a very good-looking Swiss guy who sat down once, and the two girls from the leather shop caught sight of him. They pulled out all the stops trying to flirt with him, and whilst polite, he seemed immune to their charms. They gave up, deflated, after awhile. I was intrigued; I’d never seen the girls have to work for attention, let alone have nothing to show for it at the end. In fact, he seemed a lot more interested in me, and after talking for awhile, he asked me out. The movie Big Trouble in Little China had recently been at the cinemas; there was a ‘Chinese’ girl in the movie with green eyes. Thomas’s brother was travelling with him but hadn’t been at the coffee house that day we met. As a throwback to the movie, which both brothers thought was awesome, Thomas had apparently told his brother excitedly after seeing me at work, that he had met a Chinese girl with brown hair (my hair colour at the time). Long story short, we ended up dating until he had to return to Switzerland. Thomas was the first guy I dated through working at the Old Vienna; after him, I would meet lots of other European/American travellers who similarly found me interesting. Most of them were just good coffee-mates, frankly, but it made an impression on the other girls at work. They began to joke about who Jackie’s man-of-the-week was, and my Greek supervisor begged me to tell her the secret to getting so much attention. I told her to just be natural and carry a conversation with them; I saw her try, to no avail. By this stage I was aware of what their problem was – the two hot Aussie girls at the leather shop; the British/Kiwi etc. waitresses – they weren’t exotic to look at from the perspective of European travellers; there were plenty of leggy white girls back where they came from. 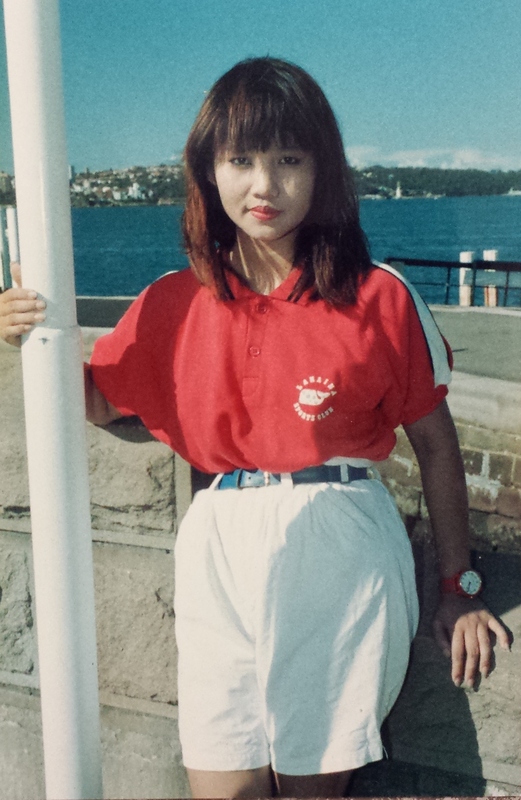 Asians with bleached hair, not so much – back then anyway. I had stood out since I came to Australia; this time, it was to my advantage. My new narrative – Europe/Europeans were so much cooler than Australians, and I should work on getting myself over there sooner rather than later.